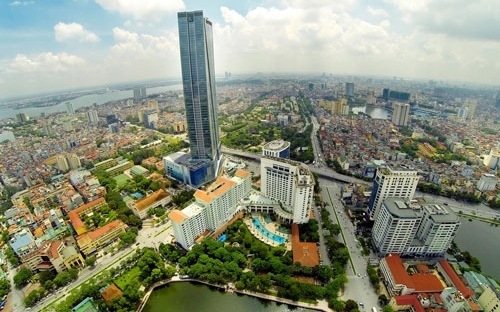 HA NOI (VNS)— Ha Noi Construction Department has announced upcoming real estate projects that have been approved for sale in the market and are being funded by 26 investors. This is the first time the department has published such a list. As the projects are completed, they will add 10,163 apartments and 585 low-rise buildings in the capital city, Deputy Head of the department's Housing Management and Real Estate Market Division Vu Ngoc Thanh said. The investors had previously informed the department of their upcoming projects to gain permission to sell the apartments or buildings to customers, Thanh told Tien Phong newspaper. But now, things have changed, Thanh said, adding that the investors' projects would be confirmed by the department based on whether conditions for sale in the market were appropriate. To qualify, the investors will have to present a land use right certificate, project documents, designs approved by an authorised agency and a construction licence. "The announcement aims to help buyers avoid risks and to constrain the investors' mobilisation of capital for the wrong purpose," Thanh said. Thus, it prevents investors from using the capital provided by the buyers for conducting other business activities, instead of using it for the building project. "It will also be a channel to cleanse the market. With the list, buyers will know which investors are qualified for sales. These announcements will be made regularly to protect the buyers' interests," Thanh said. The list of 26 projects includes real estate developer Nam Ha Noi Urban Development Joint Stock Company, which is undertaking two projects with a total of 2,368 apartments; Tasco JSC, with 258 low-rise buildings; UDIC Urban Infrastructure Development and Investment Corporation, with a project of 324 apartments; and Hai Dang Real Estate Investment JSC, with the Hai Dang City project of 896 apartments. Investors from other sectors are also included, such as Viet Nam National Packaging Production and Import Export Corp (Packexim), with a project of 222 apartments in Tay Ho District, and Vicem JSC, with 100 apartments in Thanh Xuan District. Chairman of Viet Nam Real Estate Association Nguyen Tran Nam said the mobilisation of capital and pay-in-advance purchase of houses always carried latent risks. He said the announcement of qualified investors would help protect the rights and interests of customers because those investors were being monitored to ensure they followed regulations. The qualified investors and their projects are listed on the construction department's website: soxaydung.hanoi.gov.vn.